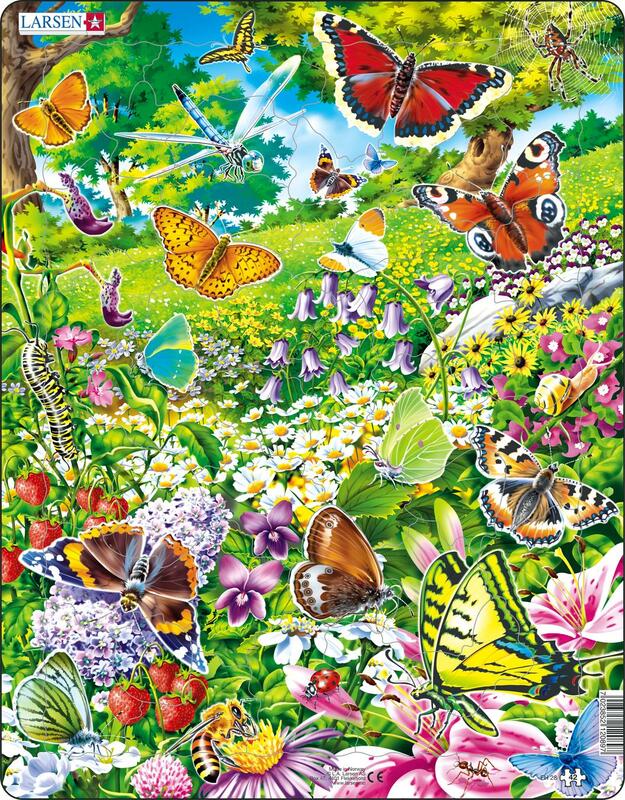 Help your child learn how to identify different species of butterflies and insects. This puzzle is designed with STEM in mind, and to help facilitate a love for science and learning. Butterflies species depicted: Scarce copper; Mourning Cloak; Dark green fritillary; Orange Tip; Peacock; Green Hairstreak; Common Brimstone; Small tortoiseshell; Red Admiral; Arran Brown; Green-veined white; Swallowtail; Common Blue. Flowers: Hammer Orchid; Dandelion; Red Campion; Marsh Marigold; Harebell; Heartsease; Common Hepatica; Black-Eyed Susan; Oxeye Daisy; Primrose; Woodland Strawberry; Common Lilac; Common Dog Violet; Lily; Cuckoo Flower; Red Clover; Aster. Others: Cross Spider; Dragonfly; Swallowtail Caterpillar; Grove Snail; Ladybird; Bee; Ant.